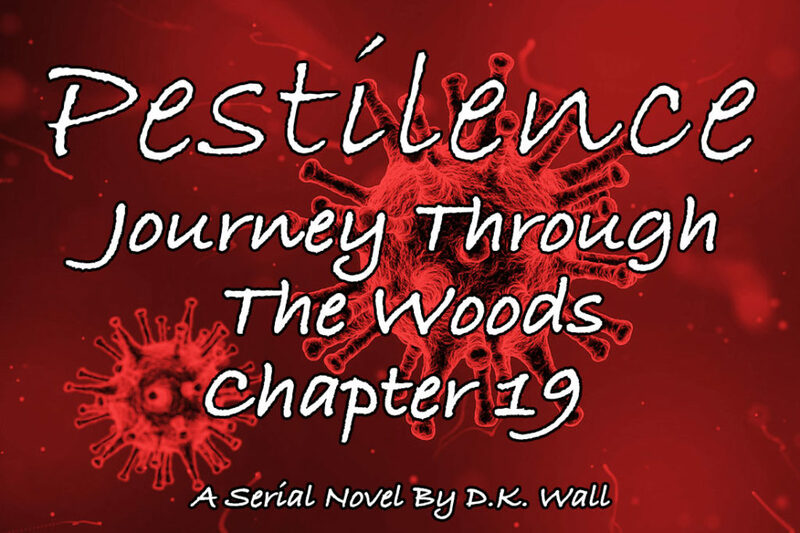 New chapters of the serial novel, Pestilence: Journey Through The Woods, will be posted each Thursday. Subscribe to have new chapters delivered to your mailbox. If you are new to the story, I suggest starting at Chapter 1. Travis ran a hand through his grungy, black hair and forced a harsh laugh. Since finding Mike on his deathbed, Travis closed his mind to everything happening around him and focused on his friend. When Mike died yesterday morning (was it really just yesterday? ), the pain enveloped him and eclipsed every other thought. Sitting alone in the shelter last night, eating breakfast this morning, hiking the trail today – all were vague memories in a dense fog. As he shuffled down the trail, his mind protested with every clump of his boot. What’s the point of getting to the ranger’s station? Meagan’s scream had pierced his veil of pity and rattled his brain. The view of her crumpled body below shocked him. And seeing Cooper slip during his descent – the way he fought and persevered – was an electric jolt through his body. Not everyone’s dead. Cooper’s not. Andrea’s not. And, by God, Meagan’s not. I’m sorry Mike, but I’ve got to live. Thirty feet below them, Cooper had tied the rope under Meagan’s arms and then attached the end to his own waist. The hastily assembled plan was for Andrea and Travis to hoist Meagan up the slope while Cooper guided her body. No matter how careful they were, the journey would be bruising. “Cooper can’t be much help. He will be fighting for his own balance, so we will have to lift both their weights. If we slip, . . .” Travis made a whistling sound and then slapped his hands together, making Andrea flinch. “We do, but there’s a better way.” Travis pulled the ax off of the side of Cooper’s backpack and trotted down the trail toward a grove of young trees. He wrapped his hand around the first one, shook his head, and repeated until the fourth tree. The edges of his mouth inched up in the slightest smile as he swung the ax at the tree’s trunk. “Hell if I know,” she muttered under her breath as she watched the first tree drop to the ground. Travis sized up several more trees before selecting his second victim. With a few fierce swings, he felled it. He soon added a third. “Perfect for what?” asked Andrea, but Travis was already cutting branches away from the main trunk. He shuffled on his knees, stripping branches as he went, until he had an 8 foot stretch cleared. He stood, grabbed the ax, and swung. With a few strokes, he had separated the strong base from the weaker top of the tree. What remained was an eight-foot long pole. Andrea joined him as they fashioned the second tree into a similar pole. When they did the third, they cut it shorter – six feet – and then Travis cut that into two sections each a yard long. Puzzled, Andrea opened her pack and removed her own coat. She mimicked Travis’ actions – zipping the front closed and pulling the sleeves inside out so they were tucked inside the coat. Even with a stretcher, Meagan would jostle across the boulders as they pulled her up the hill. But they would bind her body to the makeshift stretcher, protecting her from the worst bounces. Lowering the contraption to Cooper was easy, heavy enough to slide down the hill but not so heavy to risk pulling them over the side. Cooper rolled Meagan onto the stretcher, tied her down, and then waited while Andrea and Travis hauled the stretcher back up the hill. Once Meagan was on flat ground, Travis untied the rope from the stretcher and tossed it back down the hill. Cooper secured the rope around his waist, hoisted Meagan’s pack onto his back, and crawled back up the hill. Since the younger boy could see where to plant his feet, the trip up was much easier than down. Within minutes, they were lying on the trail, huffing from the exertion. Despite the cool air, sweat ran down their faces. They watched the setting sun as they rested, accepting the fact they faced one more night in the woods. Carrying the stretcher on the trail would be difficult enough, but stumbling in the dark risked another injury. Once moved into the darkness of the woods, Travis gathered firewood and built a fire, Cooper prepared dinner, and Andrea monitored Meagan. As the last of the sun faded, the three of them sat on logs enjoying the warmth of the fire and hot food. Meagan continued to sleep on the improvised stretcher. Click Here To Go To The Next Chapter – Chapter 20! The cover image is licensed under Creative Commons: 0.0 License from Qimono on Pixabay. Always good to see hiking tips and tricks used well, and I’m glad for the positives in working to keep the group intact.